Goats For Grandpeople is a two-hour tour for groups of seniors, scheduled March through November, with a choice of three programs. Call 760-749-9634 for reservations and more information. fond memories of when family gardening was a way of life. and dogs that love to be petted. The Logistics . . . Timing - we recommend that you allow two hours for the basic tour and an extra hour if you plan to have lunch on the garden patio. 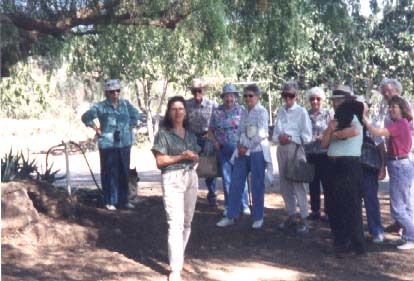 Walking - in most cases the walks and the tours can be customized to meet the needs of your group. Deluxe Luncheons - the Chef's Choice includes a salad, entree, dessert, and beverage. While individual dietary preferences cannot be met, we can accommodate an overall request in most cases. Waivers - each individual in your group (including drivers and caretakers) will need to provide a signed liability waiver which we will supply to you in advance so you can make as many copies as you may need. Prohibitions - No Smoking or Alcoholic Beverages are permitted. Reservations - We will tentatively reserve a tour date for your group over the phone, then we will send a letter of confirmation to you stating the details of your tour arrangements. We schedule farm-visits on weekdays March though November. Tours canceled due to inclement weather are rescheduled. Deposits - A deposit is required in order to secure your date. When your deposit has been received we will forward a map and a liability waiver to you. Senior's & Patio Tours: $50 nonrefundable deposit. Deluxe Luncheon Tour: 50% deposit; refunds will be subject to a $50 Cancellation Fee. No refunds will be made for cancellations given within two weeks prior to the event. Buses - Some very large school buses have not been able to make the turn onto Little Creek Lane. Medium tour buses holding 40 to 50 have generally been able to drive in with an experienced driver. Smaller tour buses holding 15 to 25 have not had a problem. 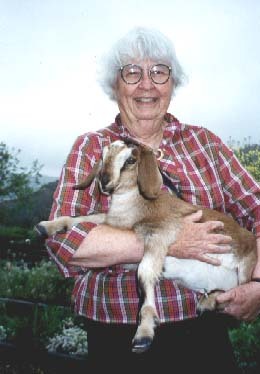 Carl Sandburg said in reference to his wife's herd: "Goats are friendly. You can talk to them. A cow doesn't know what you are saying. But these goats come up very quietly and brush against you, as if to say, 'Isn't life good?' You know, I love all goats especially the little ones. They're very special...they remind me of little angels...."
The Nubian dairy goats at Little Creek Acres are very special! Consciously bred and reared to promote harmonious temperaments, all the beauties know their names and prefer the company of humans to their own kind. They enjoy hugs and pets, sweet soft words, direct eye contact, fruit treats, and walks in the orchard. They are extremely intelligent, very psychological, and in the quiet of an afternoon or evening they emanate the vibration of peace, healing, and love.